This photo was taken of us before Dad left for the war. Mom, Dad, my little sister Jean and me. I remember the day my Dad came home from The War. We were living at grandpa's house on Cobourg Street in Stratford Ontario where my mother, sister and I had stayed all the time dad was overseas. My grandma had died not long before the war ended. The War was a big part of our lives. Every kid in school had at least one family member: father, uncle, grandpa or brother, fighting overseas. Almost on a daily basis someone in the school would learn their loved one had been wounded or killed. I was lucky. My dad was coming home from The War. During the four years he was overseas, every night we'd sit at the table in grandma's kitchen and listen to the BBC news on the radio. I still remember that static, far-away sound of the news-caster's voice. On the wall by the table was a big map, and we'd stick pins in it to show us where The Action was. There was a special pin marking the place were Dad was serving as a chaplain in the #10 army field hospital in Holland. I thought of my dad often during those years when he was away. 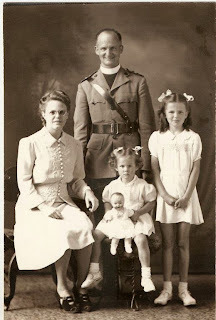 I remember going to Kingston with my mom and sister just before he was shipped overseas, and his last visit to Stratford when we went as a family for a portrait, dad looking so handsome in his arm uniform wearing his captain's hat and clerical collar. I was about 9 then and my dad was very special to me. I remember, going back to my early childhood living on the prairies, walking with my dad down country roads or visiting farm houses where he knew people from his congregation. I have a picture of myself, age 3, with dad holding me up to sit on a fence so I could pet the sheep. I remember my dad working in his garden, and preaching on Sundays, and telling me stories about his life when he was a boy in Wales, and later working in the coal mines in Caerphilly from when he was 14 to when he immigrated to Canada and met my mom. I had missed my dad so much, and when he was going to arrive home at last, I was more excited than at any other time. And then, he came home. But it wasn't the same dad I remembered. He was a different dad, still handsome in his officer's uniform, a bit thinner and perhaps more careworn. But he was a stranger. I remember running to my room, sobbing uncontrollably, partly from happiness and relief at having him back again, but also for reasons unknown to me then. I didn't realize til years later just why I had cried. Now I understand it was that he was 'different' because of all he had seen and lived through. I remember later reading through piles of letters he had saved sent to him by parents and loved ones of young men he had buried or who had been wounded. My dad's job as chaplain had been to comfort the dead and dying and their families. He had lived through terrifying and devastating experiences. Once, he told us, a buzz bomb had stopped buzzing right over the hospital. He had thrown himself to the floor and prayed. And thankfully, the bomb exploded somewhere farther away. All these experiences had 'changed' my dad. But really, deep down he was still the same dad I had known before The War, full of compassion and love and gentleness. 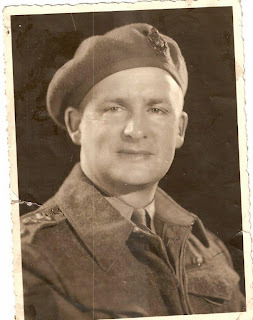 He won the MBE for his honorable service at the army hospital. And he won the respect and love of everyone he met. 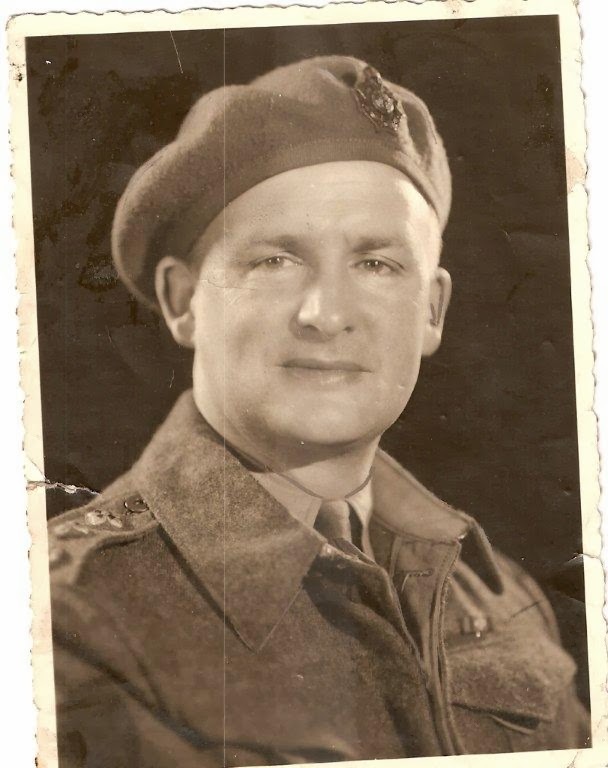 So on this Remembrance Day I still think of that day so many years ago when he returned from the war, that 'stranger', but still he was my Dad. And I think of all the children in the world who are waiting for their Dads to come home from The War, and pray they get back home safely.